I lost the recipes that Cathy had sent me from the dinner. I promised Sally I would post them last week. Today I finally admitted to the loss and asked Cathy to send them again. I hope no one has bought the ingredients already and is waiting impatiently for the recipes to appear on the blog. Remember who you are dealing with here. a stage every night and putting on wonderful plays for communities like Eureka. Ten actors in this year’s show – we had selected “Henry V” from the two options. 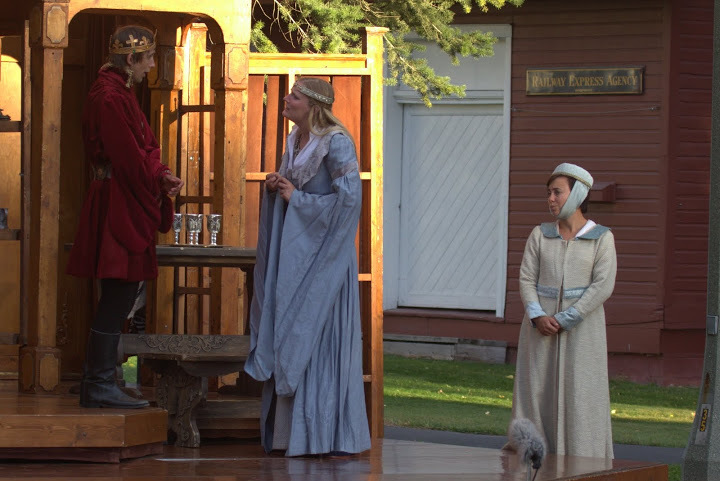 The play happens in the Historical Village and the Sunburst Community Service Foundation sponsors it which means finding the money to pay for it to happen as the public gets to watch the play for free. This year as the troupe was setting up the stage, a PBS film crew was interviewing me in the Historical Village. They asked questions about Eureka and the valley, the Village and Sunburst and such. As I tried to explain what makes the Tobacco Valley so special, I realized it is the people who give. There were those who donated to help bring Shakespeare in the Park to Eureka, the women who quilt to help maintain the Historical Village, the volunteers who made box dinners to sell before the show, the young people who offered to pick up trash and this is just the beginning. I knew the film maker wasn’t interested in my litany of volunteers so I tried explaining the idea of social capital and why our abundance despite high unemployment and low wages makes our town such a good place to live.